Kind-hearted volunteers visited Epsom and St Helier hospitals to donate Easter eggs to the young patients on the children’s wards last week. 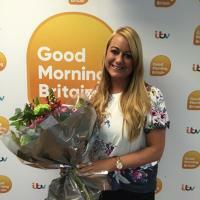 A midwife at Epsom and St Helier hospitals was crowned the winner of the Good Morning Britain’s Hospital Health Star Award earlier this week – while she was live on TV with presenters Piers Morgan and Susanna Reid! A senior midwife at Epsom and St Helier has been chosen as a finalist in Good Morning Britain’s prestigious Health Stars Awards, and will be joining presenters Piers Morgan and Susanna Reid on their famous sofa tomorrow (Wednesday 19 April) to talk about her role. Local people are being urged to only come to the A&E departments at Epsom and St Helier hospitals in genuine emergencies, as the hospitals and their A&E departments are extremely busy. Epsom and St Helier hospitals have unveiled two spacious, state-of-the-art bike ‘hubs’, providing secure storage, changing and shower facilities for those staff who cycle to work.